The Pope will canonize Junipero Serra from a temporary sanctuary that's being built on the east portico of the Basilica of the National Shrine of the Immaculate Conception. The first pope from the Americas will canonize a Spanish friar who brought the Catholic faith to California in front of the largest Catholic church in North America. There will be plenty of symbolism in Pope Francis' visit to Washington next week, and the city's archbishop said Thursday that while the pope will be speaking as a pastor, not a politician, he could address an issue that bitterly divides the nation's leaders: immigration. 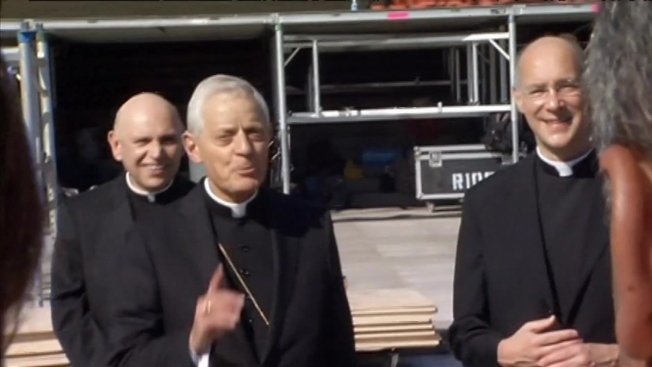 Pope Francis will celebrate the Mass of canonization for Junipero Serra in Spanish, and several thousand of the 25,000 tickets to the event will be reserved for Spanish-speaking people, many of them from California, Wuerl said. The largest Catholic church in the Americas isn't nearly big enough to hold everyone who wants to see Pope Francis perform a Mass of canonization next week. Serra established the first Catholic missions in California in the 18th Century; he was beatified by Pope John Paul II in 1988. Some California Native Americans oppose Serra's canonization, calling him a destroyer of indigenous culture. The Mass will provide an opportunity to highlight the contributions of Hispanics to the nation and the church, Wuerl said. “Historically, and we're talking now over a long period of time but certainly in the recent history, the strongest and most consistent voice for the welcoming of immigrants, for the welcoming of the stranger into our land, has been the Catholic church,” he said. 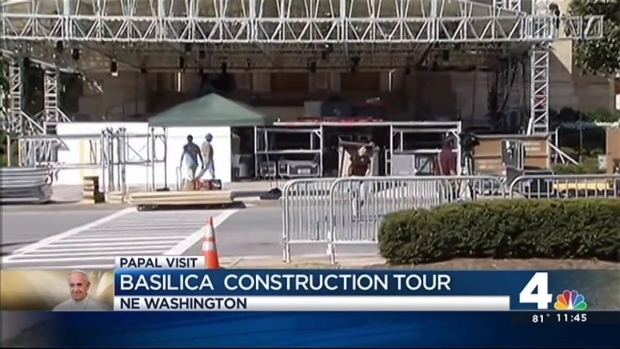 Next Wednesday's Mass will be celebrated in a temporary sanctuary that's being built on the east portico of the Basilica of the National Shrine of the Immaculate Conception. The church can comfortably seat 3,500 people, and up to 10,000 can cram inside on special occasions like Easter. But the pope's visit is more than that, and the archdiocese can't hope to accommodate everyone who wants to attend. There will be 15,000 seats on the lawn in front of the church, and the remaining 10,000 people will have to stand. “If we had 100,000 seats, we'd have 100,000 people,” said Monsignor Walter Rossi, rector of the basilica. Inside the basilica will be more than 2,000 men and women from around the United States who are studying to be priests and nuns. Pope Francis will bless them before the Mass. The temporary altar for the Mass was designed by three architecture students from neighboring Catholic University who won a design competition.